Learning languages contains very few serial processes (first you do this, only then you don that), but since what I write here is by necessity a series of articles (or at least reading them is a serial process), it might appear that adding characters to your Chinese learning toolkit is the second step in the process after looking at the various components of characters (read this article now if you haven’t already). This is true in a way, but I want to bring this up because there is overlap between the two. You should by no means learn all components before you start learning characters! Let’s have a closer look at how Chinese is structured. As we have seen, most characters are formed by combining various smaller elements that in themselves also mean something. 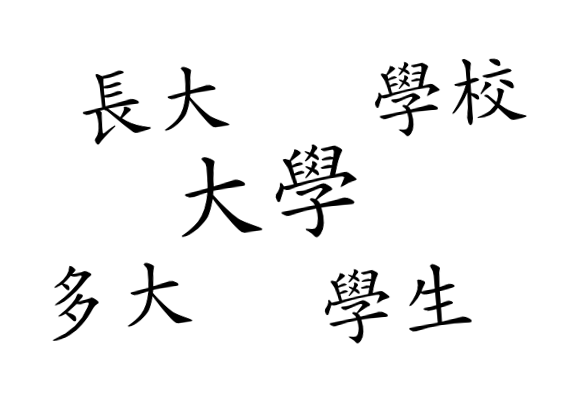 Words in Chinese work in a similar fashion, although the logic behind the construction is clearer compared with the sometimes oblique etymology of characters. 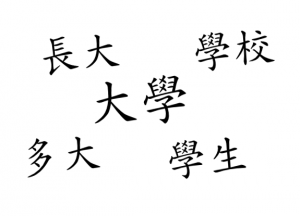 Most words in Chinese consists of two characters, but there are exceptions. For instance, train is 火车 (火車), so “fire” + “vehicle”. Very easy indeed. Want to have a railway station? Add 站, “stop, station” to the end and you’re done! What’s a word? What’s a character? 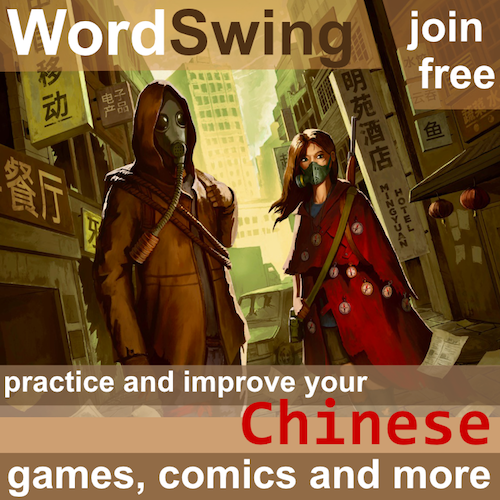 The distinction between a word and a character is unique to Chinese and is far from obvious. A character is a single written symbol. All characters have a meaning and a monosyllabic sound attached to it, but not all characters can be used independently. A word, on the other hand, can be used independently. Think of them as what you have left if you break a sentence down as much as possible without changing its meaning. So, 火 “fire” is a character, but it’s also a word, since it can be used independently in a sentence and mean fire. 火车 (火車) “train” is also a word, but it’s a word that consists of two characters. Having defined at least roughly what a character is, we can also see that the ultimate goal is to learn words, not characters. However, looking only at words is not very helpful. It would be like learning all characters without learning any of the component parts, which we have already agreed isn’t a wise idea. If you’re a beginner, you might learn that 大学 (大學) means “university”, 中文 means “Chinese” and 啤酒 means “beer”. Learning these words is fine, but sooner or later, you will have to start learning the components on your own, because few teachers focus on individual characters and components. If you use a short-term perspective, it’s completely useless to break down words into characters. You don’t need to know that 学 (學) means “study” and that 大 means “big”; it’s simply a lot quicker to learn that 大学 (大學) means “university” and be done with it. However, remember our discussion about character components? It’s not a good idea to learn maths only by studying examples! Learning what 大 and 学 (學) means separately is essential and will save much pain later. 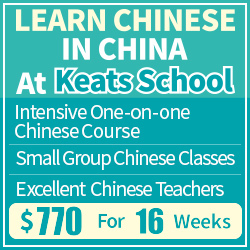 If we want to learn Chinese efficiently, we have to make long-term investments. In the long run, time invested in learning individual characters and character components will pay off handsomely. The principle is the same as it is for character parts: it’s easy to learn new words if you know the characters they consist of and what they mean. In order to use powerful mnemonics to help you remember words, even if you’ve only seen them once, you have to know the characters first! Which characters should I learn? Good question! In general, look up anything you see more than once. If this becomes too much, look up everything that you’ve seen more than twice. Apart from this, you can usually trust your textbook, because they seldom use very rare characters or words. 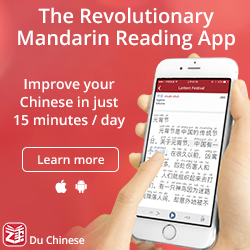 On the intermediate level, you could start looking at vocabulary lists for tests, frequency lists and so on, but using textbooks written for foreigners is still a good idea. On the advanced level, consider going through frequency lists thoroughly and make sure you know all the individual characters (doing so boosted my reading ability a lot). Still, at any levels, learning words that occur naturally in your environment is a good way avoiding extremely rare words or characters. Enough, teach me how to learn words really fast! Take it easy! This article is already long enough as it is. 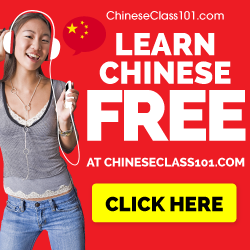 I hope I have been able to explain what individual characters are and how they can form a part of your toolkit to learn Chinese. The next step in the process is similar to combining character components and radicals into characters, but this time we’re going to combine characters into words!